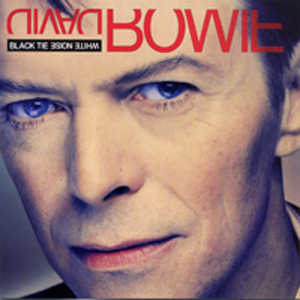 Black Tie White Noise is the eighteenth studio album by David Bowie. Released in 1993, it was his first solo release in the 1990s after spending time with his hard rock band Tin Machine, retiring his old hits on his Sound+Vision Tour, and marrying supermodel Iman Abdulmajid. 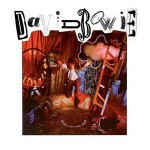 This album featured his old guitarist from the Ziggy Stardust era, Mick Ronson, who died of cancer later in the year. This album was inspired by his own wedding and includes tracks such as “The Wedding” and its reprise at the end of the album as a song reflecting the occasion. •	On the Indonesian release, Bowie sang “Don’t Let Me Down & Down” in Indonesian. •	Nile Rodgers was not given a co-writing credit for “Looking for Lester” on the original 1993 release, but his credit was added on the 2003 reissue. 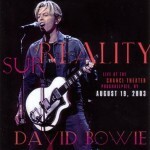 To mark the album’s 10th anniversary in 2003, a re-release consisting of the original album, a second disc of remixes and rarities and a bonus DVD of the Black Tie White Noise video was released. Songs like “Real Cool World” (a song from the Cool World film soundtrack released as a single in 1992) and “Lucy Can’t Dance” (a bonus track on the original album) were included alongside dance mixes of many of the album tracks. •	Same as the “JAE-E edit” from “Jump They Say” EU CD single. •	This mix is not included on the 10th anniversary edition. •	The Japanese release featured the “Don’t Stop Praying” remix of “Pallas Athena” as an additional bonus track. Released in 1993, this video collection was shows Bowie performing 6 (63 min) of the tracks from his album Black Tie White Noise, recorded “on Saturday 8 May 1993, at the Hollywood Center Studios in Los Angeles. The video includes additional new interview footage with David Bowie as well as 3 of his most recent full-length music videos. •	Only major musical performances are given track numbers; interviews with Bowie are interspersed between the musical numbers. 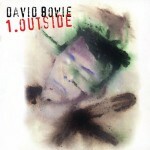 To coincide with the album’s release, Bowie commissioned an “interactive CD-ROM” be produced based on the album. Released in 1994, the Jump CD-ROM gave users a chance to remake Bowie’s “Jump They Say” video, remix “Black Tie White Noise,” and explore a virtual world based on the album (including “hidden animations, sounds, pictures and other surprises.”) It also included four complete music videos and excerpts from interviews with David Bowie about the creation of the video and album. The CD was not well received. Initially Bowie was excited with the project, expecting it to be “fully interactive, and have a nonlinear storyline” and allowing listeners to play it over and over and “never go through the same experience. The release did not live up to his expectations however, and Bowie was quoted in 1995 saying “I hated it. I absolutely loathed it. … There were aspects of it I thought had potential, but then again, there was so much information on the disc itself that made the idea of anybody using it interactively a joke. Interactive, as far as I’m concerned, is when the person who’s operating the computer has as much to say as what’s on the screen. That is interactive. And at the moment, it’s just the ABC options. Even the most sophisticated CD-ROMs are just ‘Here’s the hard information. Now, you can take one of these three steps.